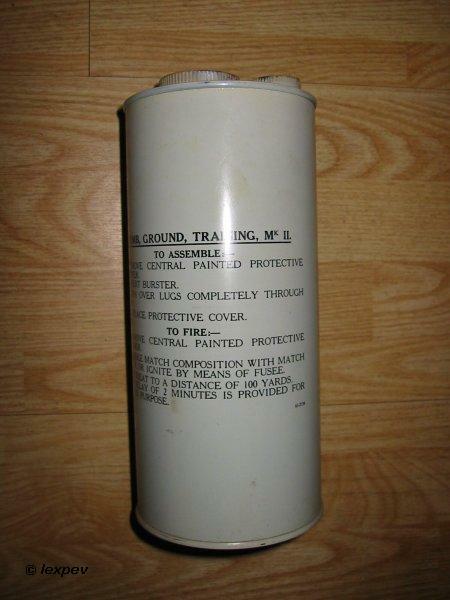 The bomb, ground, training MkII is the training equivalent of the bomb, ground, 6-Lb. It posesses similar characteristics and is used during training for putting down contamination as realistically as possible. 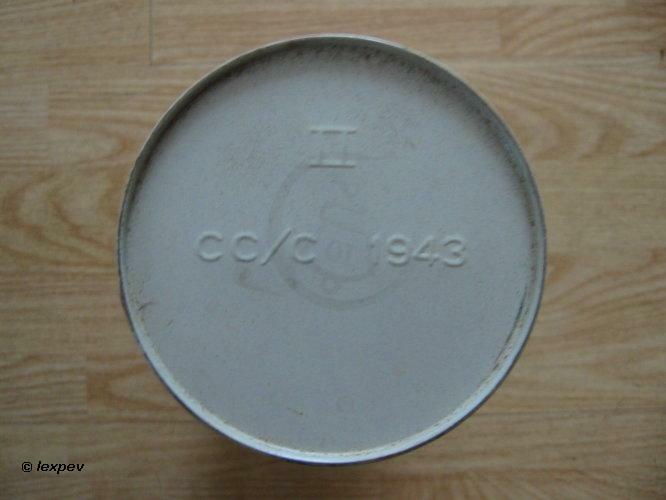 It consists of a white painted cylindrical metal container 3 3/4 in. in diameter, 8 in. long, weighing (charged) 3½ lb. (See plate II) It holds 2 pints of training mixture. 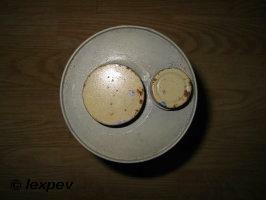 On the top of the bomb there is a central hole covered by a small lid, and a filling cap. If the lid is removed it will be found that it covers the serrated top of a metal tube running down inside the bomb. This is the burster container. Bombs are packed twelve in a box and weighing 25 lb. They must not be subjected to rough handling and must be kept dry when in store. In order to avoid risk of leakage they should not be filled until required, and, once filled, should be stored or carried with the filling cap uppermost. The burster which is issued seperately from the bomb consists of a metal tube 5¼ in. long and 1½ in. in diameter. At the top of this tube is a match composition surface connected by approximately 48 in. of safety fuze with a small charge of gunpowder (about 1/3 oz.). This length of fuze gives a delay of two minutes. Bursters are packed in metal cylinders twelve in a box weighing about 7lb. and since they contain gunpowder will be stored in accordance with the provisions of Magazine Regulations. 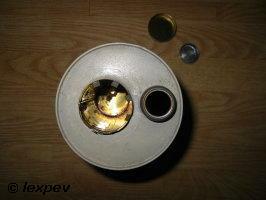 In order to prepare the bomb for use it is necessary to charge it and insert the burster. To charge it, unscrew the filling cap, pour in training mixture to within ½ in. of the top, replace the filling cap and screw it home with a screwdriver or coin. Screwing with the fingers alone is not sufficient to prevent leakage. To insert the burster, remove the small lid from the burster container, push the burster down into the container and then bend the serrated edges inwards through 180 degrees so that the burster is held firmly down. The lid can be replaced. To fire the bomb, place it on its side on the ground with the base down wind and remove the lid from the burster container. Strike the match composition surface with a safety matchbox or touch it with a lighted match or fuzee. 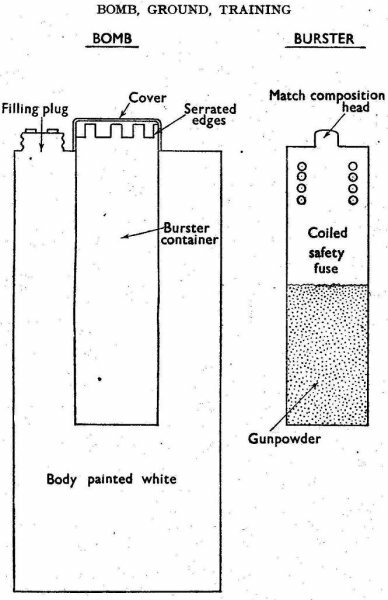 The match composition surface will ignite the safety fuze which, after a delay of two minutes, will fire the gunpowder. If more then one bomb is being used at the same time, all should be placed in position before the first is fired. The charging must, and the insertion of the burster may, be effected previously. If the burster is thus inserted, the lid of the burster container must be replaced in order to protect the match composition head. One bomb will heavily contaminate an area of about ten square yards, most of the pattern being down wind. Fragments of metal may fly to a distance of 25 yards. A certain amount of spray will also be thrown out, mainly down wind. The delay between the time of ignition and the time of burst must therefore be used in getting well clear. An earlier mark of bomb may still be met with. This is similar in construction to the Mark II bomb described above, the essential differences being as follows: Size: 3½ in. in diameter by 5½ in. long. Charge: 1 1/7 pints. Weight, charged: about 2 lb. Size of burster: 1 in. in diameter by 5¼ in. long. Length of safety fuze: Approx. 12 in. Delay: 30 seconds.